CLAS organizes and collaborates on a diverse array of events that relate to student and faculty interests in addition to reaching out to members of the local community interested in Latin America. CLAS supports a wide variety of outreach activities: in 2017–18, we organized and cosponsored nearly 100 events, including conferences, lectures, panel discussions, art exhibitions, and musical performances. CLAS works closely with nearly two dozen partners—on campus and throughout Chicago—that make our programming possible. Visit our Events Calendar to see upcoming public programs. Sign up for our Mailing List to receive regular event announcements. 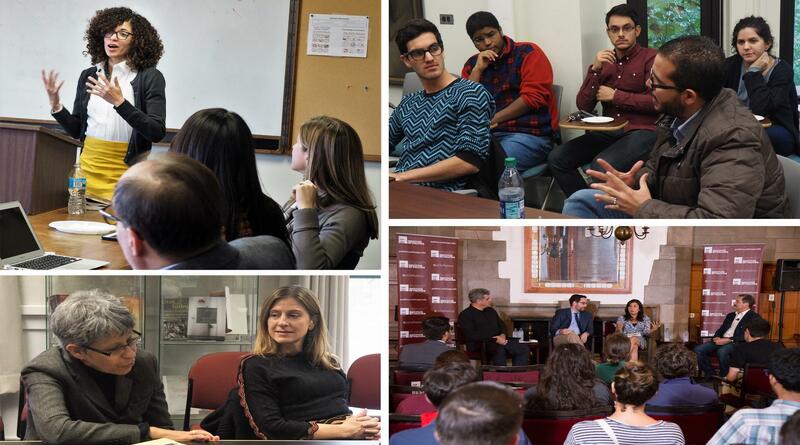 During the academic year, CLAS accepts proposals for UChicago faculty- and student-led conferences and events. Please review our guidelines for submitting an event proposal. CLAS considers proposals from UChicago faculty, students, departments, and units—as well as from external academic and cultural institutions—to organize or cosponsor events. These programs may include, but are not limited to, conferences, lectures, invited speakers, community engagement, art initiatives, and other events both on- and off-campus. If you wish to propose a speaker for one of CLAS’s lecture series, you are welcome to do so. We also accept proposals for a Spanish-speaking audience. CLAS provides financial and administrative support for a limited number of activities each year, which are considered on a rolling basis until funds are exhausted. Given our resources, CLAS welcomes proposals to organize small, on-campus events such as single lectures, public presentations, and panel discussions. For larger events—conferences, exhibits, and performances—,CLAS only accepts cosponsorship proposals and encourages applicants to seek support from other departments or institutions. Brief description of the content and thematic relevance of the event (400 word limit). All events must have an academic or cultural significance. CLAS does not support social events. If applying for sponsorship, please specify the amount of funding requested or, if applicable, the type of administrative help that is needed (e.g., publicity, logistical arrangements, accounting). All initiatives that receive funding or other forms of support must include the name and/or logo of CLAS on all printed and digital publicity. Please submit your proposal as early as possible, but no later than two weeks prior to the date of your event. Please note if a proposed participant has been Tinker Visiting Professor at the University of Chicago in the past five years. Individual travel by UChicago faculty and students will not be considered for funding. Submit your proposal to Natalie Arsenault, Associate Director. The Latin American Briefing Series (LABS) brings influential academic experts, journalists, and policymakers together at the University of Chicago to explore emerging current affairs that will shape future social, political, and economic trends in Latin America. LABS events are advertised through our events calendar. Video and podcast recordings of all LABS events (since 2004) are available through our Publications and Videos page. CLAS proudly supports two Graduate Workshops, the Latin American History Workshop and the Workshop on Latin America and the Caribbean. Both groups meet biweekly in Kelly 114, CLAS's seminar room. Workshop meetings are listed on our events calendar. Given our considerable resources and the close ties Chicago has to Latin America, CLAS organizes public engagement activities that extend the impact of the University into our local and regional community. Regular K–16 educator training workshops (organized with on- and off-campus partners), the current events-themed Latin American Briefing Series, and performing and visual arts presentations constitute a rich outreach program that reaches sizeable audiences. Visit our Public Engagement page for more information.